Ahh…mangoes. How I love thee. The continuous winter weather we are having here in the Rocky Mountains has me dreaming about a week at the beach in the warm sun. So while I can’t transport myself and the rest of the family to the tropics at the moment (hopefully one day soon! 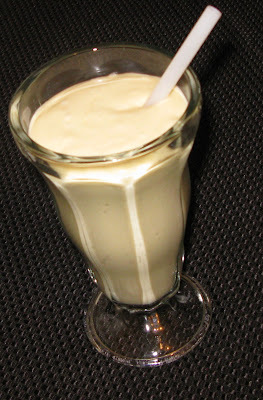 ), I can make a beach worthy milkshake. I love milkshakes, but haven’t had one in years from a restaurant due to the ingredients found in commercial milkshakes. 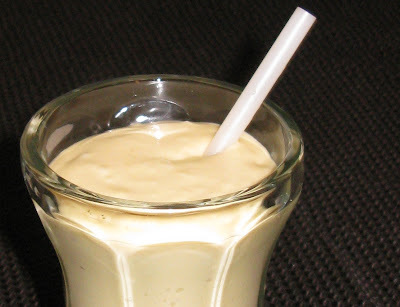 This “milkshake” is made up of only five ingredients with the base being coconut milk. It is a good fix for any sweet tooth you may have or if you just want to treat yourself to something special. I often make this drink for my daughter as a quick, healthy snack before swim lessons or a trip to the park. Mangoes are loaded with potassium and Vitamins A, C and E. The addition of banana to this drink adds a boost of fiber and manganese to the drink. Coconut milk is rich in lauric acid which has anti-viral properties that help to boost the immune system. Blend on high for 2 minutes until smooth and creamy. Serve in a glass and enjoy! This recipe was shared on Superfood Sunday, Inspire Me Monday, Simple Lives Thursday, Tastetastic Thursday, Healthy 2 Day Wednesday, WLWW, WFMW, Frugal Days, Sustainable Ways, Gluten-Free Wednesdays, Real Food Wednesday, Midweek Fiesta, Hearth and Soul Blog Hop, Totally Tasty Tuesdays, Traditional Tuesdays, Get Your Craft On Tuesday, Fat Tuesday, Slightly Indulgent Tuesday, Barn Hop, Melt in Your Mouth Monday, Meatless Mondays, Monday Mania, Better Mom Mondays, The Sweet Spot, Mix it up Monday, Sugar Free Sunday, Sunday School, Strut Your Stuff Saturday, Seasonal Inspiration, Fresh Bites Friday, Wellness Weekend, Sweet Temptations, Sweet Treats Thursday and It’s a Keeper Thursday. What a fun, yet simple recipe. I can tell my kids would love this. And my husband LOVES mango, as do I. Thanks for a great recipe! Upper 70's?! So jealous!! I am dreaming about Spring right now. I can't wait to play outside with the kiddos and start gardening again. I think I have to wait until next month to enjoy warmer weather. I have found frozen mangoes at my local Costco Maureen. Hopefully you don't have to travel too far! Now if summer could just get here faster! Delicious milkshake! Yum! Looks and sounds fabulous!!! Thanks for the tip about the coconut milk brand-I worry about that and try to seek out companies that are BPA free. This milkshake looks great. I used to make mango lassies a lot but haven't recently. Your version sounds great with the addition of banana too! I bet this does wonders for your daughters sports performance !! We are big smoothie fans here. Mango lassies–yum! I want that recipe 🙂 This drink really is great for my daughter as well as for me. I love to have it before or after a workout. I'm a big mango fiend also! I SO want one of these for dessert today! I'm pinning this. Thanks for sharing! Mangoes and Coconut milk… now *that* is a combination I haven't tried! Looks and sounds absolutely yummy! 🙂 Thanks for sharing it at Sugar Free Sunday! I love anything coconut! Thanks for sharing, looks yum! Oh yum!! Thanks for linking up with The Recipe Party! What a great idea- and Vegan too! Hi laura, I will be featuring this smoothie recipe in my post, "10 Super Smoothies", fyi! Can't waIT TO TRY IT! This looks absolutely wonderful and nourishing. Would you mind posting it to my pregnancy food blog carnival superfood sundays. I have lots of vegan pregnant women who read it and would love to have this option on it!!! It's really looking one of delicious stuff. I really love that one. As the post shows extreme exceptionalness about that one in this source. I am totally crazy to see this one. Thanks for sharing.